Do you feel intensely moved by the beauty of Nature? Do you sometimes feel more connection with animals than people? Does the awareness of our widespread impact on animals and the planet leave you feeling heartbroken, anxious or overwhelmed? According to research by Elaine Aaron, PhD, about 15-20% of humans and other species are wired a little different than most. (Ever relate to the ditty, “One of these things is not like the others?”) The Highly Sensitive Person (HSP) is exquisitely attuned to their environment and those around them, which provides an evolutionary advantage for species survival. Now that we no longer live in survival mode on the land, our exposure to endless sensory stimulation from crowded urban living, high pressure workplaces and 24 hour access to the Internet, has created a set up for feeling constantly overwhelmed. In order to thrive it is very important to understand the gifts and challenges of being an HSP and develop self-care practices that nurture and protect your sensitive nature. Why is this so critical? Because within your sensitivity is a gift that is needed by the world now, more than ever. Along with being very aware of everything going on around us through our senses, many of us are highly empathic, that is, we are particularly astute at picking up what others are feeling. For some of us, this extends beyond other people to include animals, and even the Earth. Our deep connection with the more-than-human world can leave us anguishing over the mistreatment of animals and devastation of natural places. We feel the pain of the cows in a transport truck we pass on the highway, or the old growth forest as it is cut down for logging or development. It is very easy for HSP's to end up in a state of overwhelm, which impacts us physically, emotionally, cognitively, and spiritually. When overwhelmed we exist in a constricted world of fight (anger), flight (anxiety), or freeze (depression, despair or numbness). I believe some HSP’s have been called by either the animals (sometimes a specific species) or the Earth to bring their gifts to the world on behalf of that cause that most tugs at their heart. The animals and the Earth want to work with and through us to bring change. For those who are struggling, I would like to help you answer that call by sharing ideas and guidance with you that have helped me along this journey. In my next post I will share 3 essential practices to help HSP-A/N's move out of overwhelm and back into the flow of life. What do you see when you look at this image? What is the story that comes up in your mind? I first spotted the female Canada goose on her nest about 3 weeks ago. I was excitedly waiting for the goslings to hatch. I was careful to avoid going anywhere near the nest. Then one day I noticed she wasn't there anymore. I decided to go have a look and found remnants of egg shells everywhere with one shell several feet away on the trail. I felt so sad thinking that a coyote, fox or other predator had ravaged the nest and eaten the eggs. I took this photo two days later, believing that I was watching a pair of Canada geese inspecting their nest site and mourning the loss of their eggs. I felt a sense of grief for them and wondered how ducks and geese ever manage to raise any babies with so many threats surrounding them on the land and in the sky. The idea of building a predator-free nesting spot for them crossed my mind, but I realized that I had to honour Nature's wisdom and cycles of life. Yesterday evening when I arrived at the pond I noticed the couple move from the marshy end of the pond onto the water. Much to my surprise and delight I spotted five fluffy goslings paddling close behind their Mama. They headed straight to the nest site in the photo above. When I got home I zoomed in on the photo above and spotted a gosling in the grass! It would appear that, rather than mass carnage, the pieces of shell everywhere were the remnants left behind after the goslings pecked their way out of their eggs. Their Mama had actually fended off the ravens, owls, pine martins, coyotes and fox to hatch five gorgeous babies! This was a powerful reminder for me to always remain curious and avoid jumping to conclusions. Sometimes the story we write in our heads is not what is actually going on at all. In Remembrance of "Red Dove"
I don’t know the name you were given back when you were a carefree colt with your whole life ahead of you. I’m not sure of the path you have traveled to arrive in this place or when you were betrayed by those entrusted with your care. Despite being thrown out like garbage because of a leg injury you likely incurred desperately trying to please the humans you served, you still approach me with kindness, simply wanting to connect with someone who sees you and cares. Your neck has fresh wounds from being roped. Why did they feel the need to treat your gentle soul with such disdain and cruelty? Why is no one else willing or able to sense your fear, your pain or your call for help? Why are they afraid to look into your eyes? It was my first auction and I was only able to rescue a couple of horses. 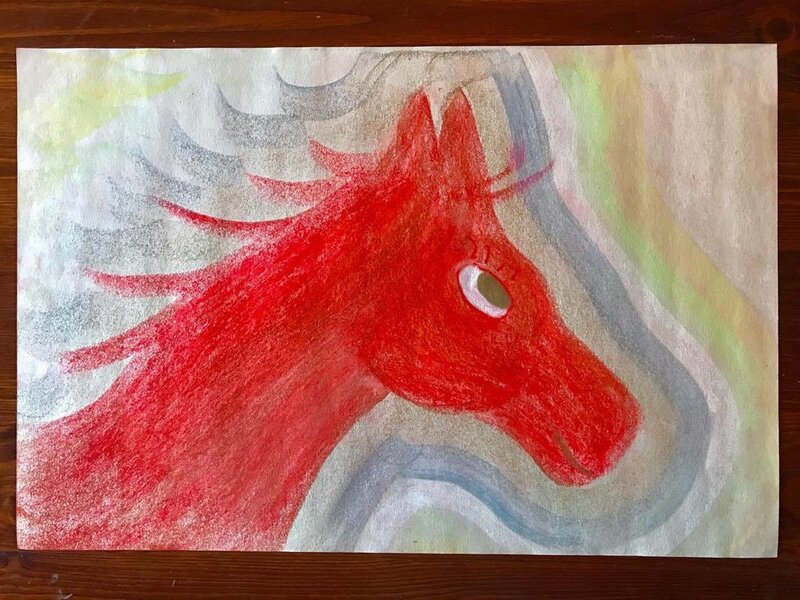 Surrounded by countless pens of “loose” horses whose fate was a one way trip to Fort McLeod if no one bid against the meat buyer, I was overwhelmed by a profound grief and helplessness I had never felt before. I could only bring home two horses, and I had to consider how “adoptable” they were in making my choice. In the end I was able to give a second chance to two weanlings, a Percheron (Luna) and a Belgian (Cosmo). I sobbed for two days straight thinking about you and the others I had to leave behind. I am so sorry that I was not able to rescue you and give you the life you deserved, and that you were alone and afraid when you left this world. I still think of you and feel a deep wave of grief pass through me. Although I was unable to bring you home to FSS, I can see now that taking a moment to gently and compassionately look into your eyes and see you, while holding the space for you in a time of need, did make a difference, even as it shattered my heart. I want you to know you mattered to me. Your life mattered. You are loved and I will remember you always. May your spirit run free, my beautiful friend! And now I will go hug all the horses I was able to bring home.